This is my first time raising chickens! 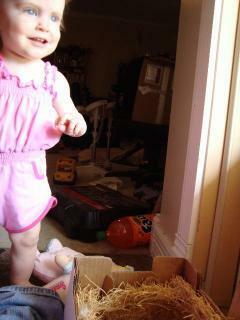 My grandfather had an egg business, so I guess my love of the chickens came from him! I love my animals, but three dogs is about all we can handle, especially with a new little one, so my mind wandered back to chickens. My husband had agreed to chickens when we moved into our own house, we've lived in our house now for over a year, our city allows them with few restrictions (mostly distance) so it was time to cash in on our agreement. Since we were in a totally different climate than my grandfather had his we choose more for heat tolerance and egg color than production (which is almost the same these days, the breeds were almost all the same production wise). Anyway, I ended up choosing a variety to get a good feel of each of the breeds we got. 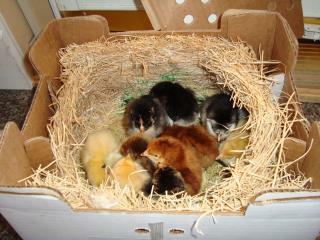 Born Memorial Day, we now are the proud parents to 2 Astralorps, 2 Easter Eggers, 2 Golden Wyandottes, 2 buff Orpingtons, 2 Rhode Island Reds, and 1 silkie (that was my husband's pick!). I'm just in love with all the peeping going on , they are just the cutest little fuz balls! 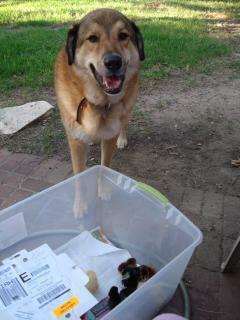 This is one of my three dogs, Wicket (he is a big baby, so I guess it makes sense he would like to "mother" the chicks), he likes going up the the brooder box and sniffing them and trying to lick them. 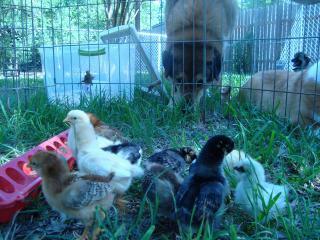 We've told him they will make him pay for this later (picture, giant 100lb dog being chased by a flock of chickens! ), but he's in love ! Our girl dog, Cranberry, was mildly curious, but couldn't really care. Our little Corgi, Gizmo, is interested but scared, the last time he met new animals (our rabbits) the rabbit thumped him and chased him off! Update 6/6/09, I can't believe they are getting so big so fast! They had a blast on their first quick trip outside (they got to scratch, flap those little bitty wings, and explore for half an hour). We've finally got names for all of them. The two RIRs are Rose and Ruby, the two BOs are Blanche and Suki, the two GWs are Moxie and Roxie, the two EEs are Daphne and Henrietta (I think she's my favorite so far), the two As are Barbarelle (Barbie) and Bindi, and the little Silkie is Georgette.